I made cookies. That can be exceptionally difficult without cookie cutters. I was able to make doughnuts without a doughnut cutter, but making cookies without cookie cutters is much more difficult. Especially if they’re cut-out cookies and you don’t want to settle for circles (or strangely shaped ellipses). I tried making cookie cutters out of tinfoil before but it’s a pain. I decided I would ask around if anyone had any cookie cutters I could borrow in exchange for, well, cookies. I amassed a collection of cookie cutters overnight and now owe about a dozen cookies to different people. I really should buy some cookie cutters, but I can’t be bothered. I’ll have to live with giving away half of every batch of cookies. 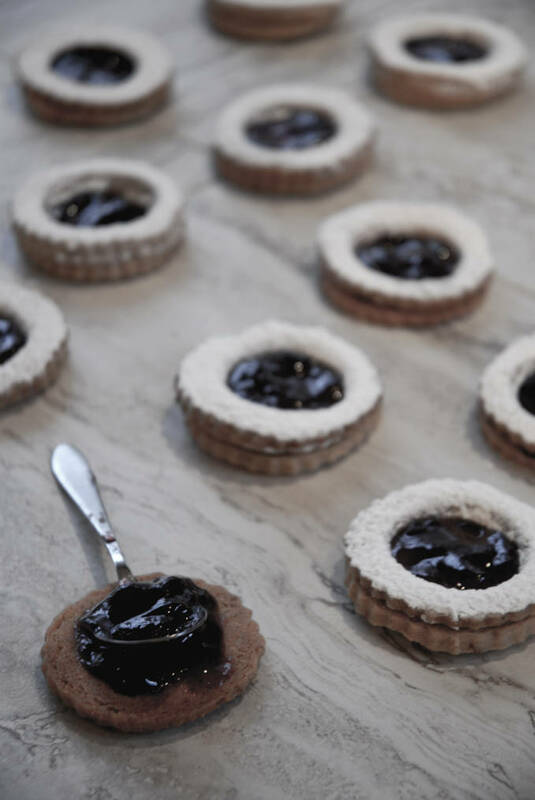 The traditional linzer cookie is made with black currant jam sandwiched between two almond cookies. Over the years most people have moved to raspberry jam because it’s easier to find and has a brighter colour that is much more appealing to the eye. Any jam can work though, really. It’s best to use a jam that’s acidic though to balance the sweetness of the cookie. If you use a sweet jam, like strawberry, mix in some lemon juice. I was considering using kiwi jam but I ran out of kiwis. That would’ve been super cool though. Green cookies. You could also use lemon curd or lime curd if you don’t like jam or are looking for a new flavour combination. Instead of using just toasted almonds in these cookies, I incorporated some roasted pecans into the cookie dough. That really kicked up the flavour and made the cookie dough super delicious. If you’ve ever made cut out cookies before you may have had trouble with the cookies keeping their shape after being baked. I used a fluted cutter for these and those little curves on the circumference of the cookie drove me crazy. I rolled out the cookies and I just couldn’t transfer them to the cookie sheet without messing up their shape. It’s especially important to keep linzer cookies the same shape and size because you have to stack them. Otherwise I wouldn’t have really cared. I ended up spending about two hours struggling with these. I did figure out a cool, but unorthodox, trick to roll out cookies during that time though. It totally goes against all the cookie rules. I took a piece of room temperature cookie dough and a square of parchment paper. I pushed the cookie dough against the parchment paper. I took the cookie cutter, cut the dough, and peeled the parchment paper off of the cookie dough while transferring it to the pan. The only reason that you have to keep cookie dough cool when cutting it is so that it doesn’t stick and so that when you bake it the cookie dough doesn’t spread. Mine didn’t stick because it was on parchment paper, and then I chilled it in the fridge before baking so it didn’t spread. I didn’t have to put up with dirty counters (well, I did, because I spent the first hour trying to roll out the dough) and it’s super easy. As long as you chill the dough after cutting the cookies out everything will come out fine. I haven’t seen this method used before. I’ve seen people cut out the cookie dough on the parchment paper they bake the cookies on, but not this. Is there any reason you can think of why this isn’t a good idea when the cookie dough is really sticky and precision is important? Do you have any cookie cutting tips? 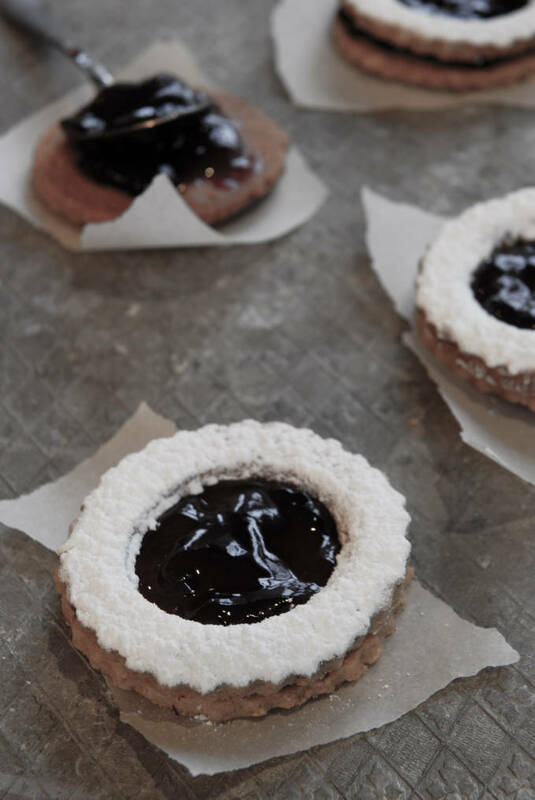 Pecan linzer cookies with a raspberry jam filling that are dusted with icing sugar. Preheat your oven to 350°F and spread the almonds and pecans on a baking sheet. Bake for eight minutes and then cool to room temperature. Process the nuts in a food processor with the cornstarch and white sugar until finely ground. Beat the butter together with the brown sugar until light and fluffy on the lowest speed on your mixer, or by hand, for about three minutes. Beat in the vanilla extract, almond extract, and the egg yolks. Mix in the ground nuts and then sift in the flour, cinnamon, salt, and lemon zest. Mix until well combined. Divide the dough in half, wrap in plastic wrap, and let chill in the fridge for at least an hour. You can either roll out the dough on a well floured surface and cut out all the cookies at once (but it will be sticky) or you can squish a bit of the dough on a piece of parchment paper, cut out each cookie individually, and transfer each cookie individually to a parchment paper lined baking sheet. Using a cookie cutter (round, fluted, heart shaped, etc.) cut out as many cookies as possible. In half the cookies use a cookie cutter to cut out the center. Use this dough to make more cookies and cut out the centers in half of them. Chill the cookies in the fridge for half an hour while preheating your oven to 350°F. 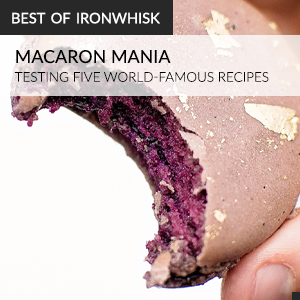 Bake the cookies for about eleven minutes, or until the edges have lightly browned. Let the cookies cool to room temperature. Spread about a teaspoon of jam on each cookie that isn't missing a center. 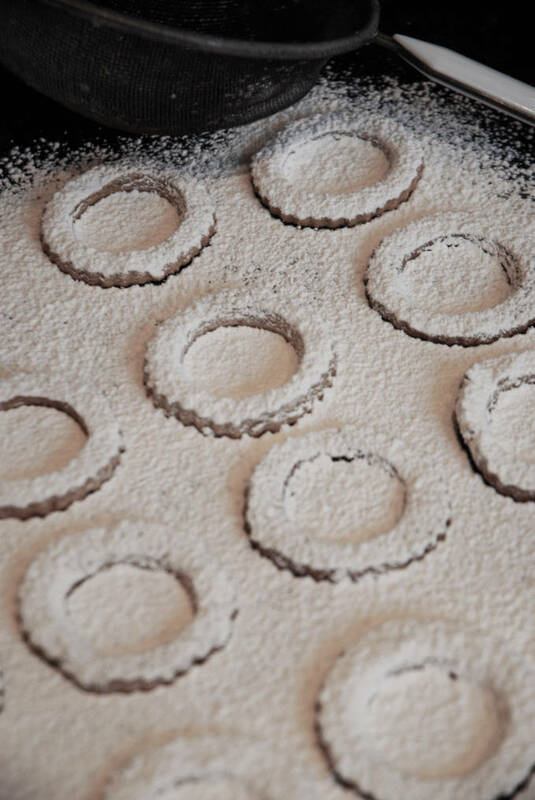 Dust icing sugar over the cookies that have cut out centers. Sandwich the two cookies together. These look great Ilan. I love pecans so I know they’d definitely be delicious! Ilan I have TONS of cookie cutters except Linzer cutters. Those are on my list of things to get for my kitchen So I suppose I could make some funny shaped linzers. Or just get some and trade you cutters for some of these amazing looking cookies!! P.S. your cookie transferring process is genius. What I will do is roll out the dough on the silicon bake mat I use on my cookie sheets, cut out the cookies evenly spaced,and then peel away the extra dough so there is no transferring of the delicate cookie. So they are already to go on the mat. I carefully slide the mat onto my cookie sheet to chill then bake. So far its worked great! You can borrow my cookie cutters too! :) Your cookies are awesome! Those look delicious! I love pecans. I would have never thought of that method to transfer the cookies. Genius! the roasted pecans in here are such an inspired touch, and i think your method is genius! What a beautiful cookie, and a European favourite. I have amassed a great collection of cookie cutters and I’m still looking around for unique shapes, but I prefer the traditional shapes, particularly this one! Nice work. Wow. What beautiful treats. Almost too beautiful to eat. “Almost” Thank you for sharing your recipe and process. Gorgeous photographs, as always! I’m glad to be back visiting your blog! I have had to check out of the internet world for the past month or so, and it feels good to be back. I hope you have a beautiful day! These look like a delicious and very pretty holiday cookie! I always enjoy cookies that use raspberry jam and nuts. Kiwi jam? my gosh, I didn’t even know!…but what I do know is that these cookies rock!!! The good thing about exchanging cookies for borrowed cookie cutters is you don’t eat so many cookies that way. Of course that’s also a bad thing! Anyway, these look terrific! Really good stuff – thanks.